The UK supplier of snacking, breakfast, baking and cooking products, Whitworths, is specifying tesa Lift & Reseal tape as part of its drive to provide healthy, nutritious and long-lasting products to the nation’s consumers. 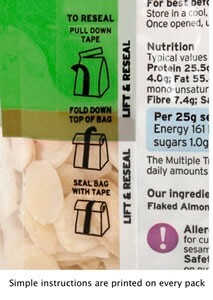 The range also includes tesa Lift & Reseal, a residue-free finger lift resealing tape offering a clean, easy to use solution for securely reclosing food packs. The tape’s robust adhesive allows for a secure reclosure system. Using an adhesive which will not leave messy residues, the packs can be opened and reclosed at least 20 times. The adhesive mass will not discolour and packaging keeps its perfect look for up to 24 months. A fingerlift edge on Lift & Reseal gives consumers an easy to use product. In the food retail industry, convenient packaging solutions have been identified as a key factor in the consumer’s product selection process. Now, one of the UK’s largest supermarket chains is stocking products featuring tesa Lift & Reseal on different ranges of snacking and home baking products.